Among the services SCS provides are our construction and retrofit. Are you planning on expanding your facility? Need to add a new chiller plant? Replace that old rusted cooling tower? Need to refurbish that old air handler with new coils? Tenant build out? We can handle it. We can replace your old rusted steel piping with new steel piping, copper piping, PVC piping. Whatever the application calls for we have the experience to take care of it at minimum inconvenience to you. Need to save operating cost? Ask us about variable frequency drives on your equipment. 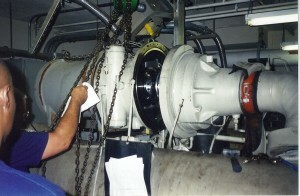 They save money, reduce noise and reduce maintenance cost. If you have inlet guide vanes on your variable air volume air handlers, get rid of them and add variable frequency drives and start saving money. If you need to replace equipment in difficult locations, we can do it. We have experience with all piping methods. Welded steel, grooved steel pipe, brazed copper pipe, grooved copper pipe, mechanical compression copper pipe, glued or grooved PVC pipe. We can handle any piping job. Overhead, underground, vertical risers, condenser water piping, chilled water piping, steam piping, no job is too challenging. Navien hosted several contractors from different regions across the U.S. and Canada to take part in a contractor roundtable discussion. Leading vendors, including Oracle, Autodesk, TAMLYN, Goodman, and Trimble, will present information on the latest tools in architecture, engineering, and construction in the Learning Theaters during the AEC BuildTech Conference & Expo.